Database Consulting Services are like work assignment and its duration depends on type of work assignment and its dependency on other Infrastructure layers like Network, OS, Storage, Application, Interfaces, Tape Library etc. We also call it as one-time DBA consulting projects. We work across Oracle and Oracle RAC technologies. We have strong expertise in UNIX, Linux, and Windows Operating systems. We have good knowledge of applications like SAP, Informatica and Abinitio which use oracle and oracle RAC databases. 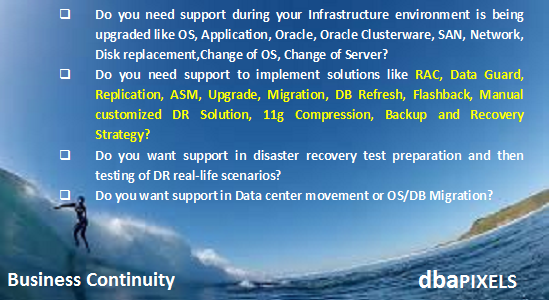 Backup, Restore and Recovery Strategy, Build and Implementation, RMAN setup, RMAN Tuning etc. DR Planner, Disaster Recovery solution planning, testing & implementation, Data Guard, Data protection strategies using Flashback recovery, Managing disaster Recovery sites, Disaster Prevention measures, Disaster Mitigation measures, Drill management. Oracle SQL and PL-SQL Development – We can perform virtually every Oracle programming & development task remotely. 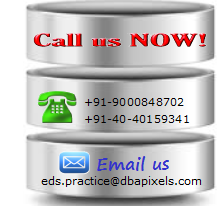 We have expertise in PL/SQL Programming. 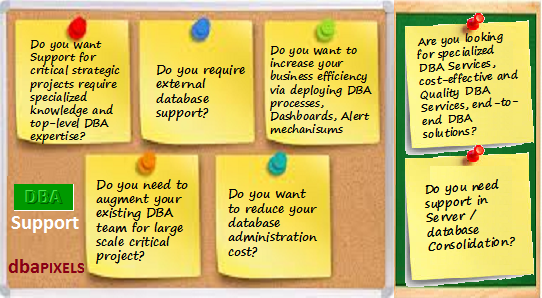 Establish DBA Dashboard management processes/system – Build and Implementation with metric, threshold values, Alert mechanism, Severity levels, Alert frequency, Email notifications, Reports, Graphs/Charts, Growth Pattern analysis etc. 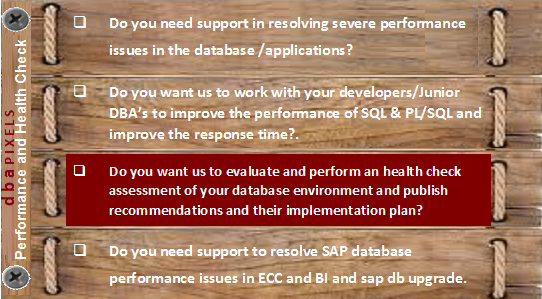 We will assess your database environment, Identify the current and target states, analyze the challenges, risks and opportunities and provide you with a set of recommendations to improve stability, Continuity, Security, performance, reliability, availability and recoverability of the databases. It includes Architecture Assessment, database design Assessment, Performance Assessment, Backup & Recovery Assessments, Business impact Assessments, Migration or upgrade assessment, Database Server hardware resources/OS/Storage/Network configuration Assessment and an assessment of your business requirements (types of data and transaction volumes). It is a packaged service. 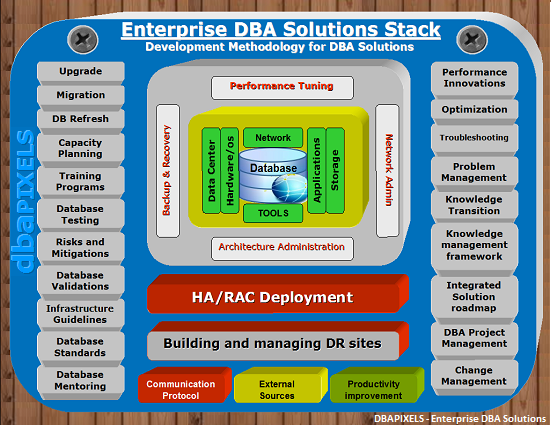 Remote DBA Oracle support services are an attractive outsourcing option for many reasons like it is a virtual extension of your database team. We also call it as proactive Support. We will discuss the coverage of Remote DBA Support and how it will be carried out and what benefits you are going to get from Remote DBA support services. A communication protocol - Access to direct communication with administrators at OS, Storage, Network, Application and database Layers. Proactive support Duration can be weekly, Monthly, Quarterly, Half Yearly or Annual. It can be on selective area(s) or as a whole database landscape support in all perspective. It can be as Part-Time DBA Support. It starts with knowledge Transition, Assessment and follow up with enhancement plan (Fine Tuning), reorganization activities, routine maintenance tasks and Process Improvements. We will customize a program to fit your needs. We have unique service offerings to accommodate any business situation. Whether your company is small or large, we will customize a program that is just right for your business with the help of our DBA support practices & Planned maintenance practices. We monitor database metrics with alert mechanisms & detect impending problems before they cripple your database. It Monitor, Discover, Classify, Assess, Prioritize and Fix it. We also analyze change in data/performance trend pattern and proactively capture potentially dangerous disturbing trends and take appropriate and corrective measures. It includes routine maintenance activities along with Demand Based Activities. Initial configuration review and problem discovery, Recommendations & full remediation of any problems discovered. To optimize the performance, stability, availability and security of your databases via sound and proven DBA practices. Executive Dashboards on several database metrics. Call now or Email us for any queries or for a custom quote relating to Oracle Database consulting, remote DBA support, Emergency DBA Support and Corporate Training requirements.